Modern furniture for modern times. Contemporary, Rustic, Warm Industrial, Midcentury Modern, Farmhouse—whatever your style is, we can build it. When it comes to dining table design, the sky is the limit. Whether you like steel, wood, concrete, zinc, or a mix of them all, we can do it. We have several popular designs that you can choose from, or we can work with you to design and fabricate something entirely custom. The choice is yours. 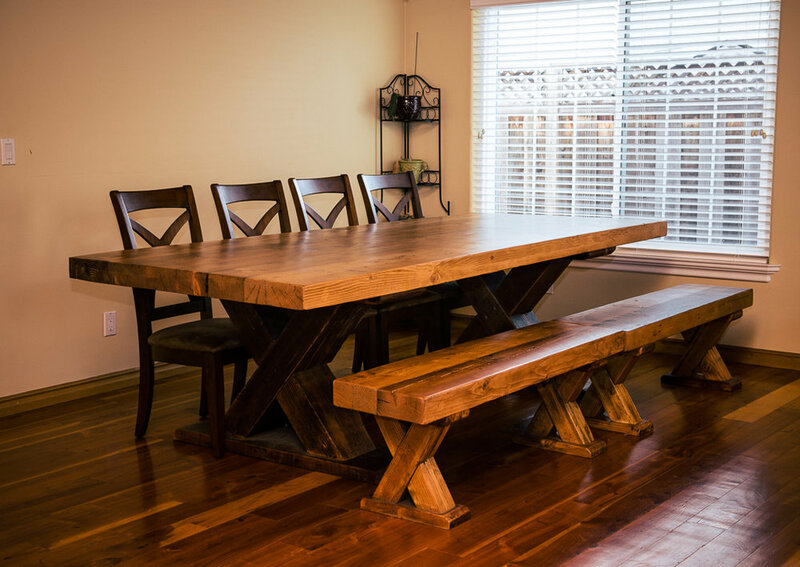 Our dining tables start at $375 per linear foot. Comfort has never known such style. Terra Amico headboards, bed frames, dressers, and nightstands, all tie together to bring luxury and warmth into your sleeping space. Whether you prefer reclaimed wood, steel, or a mix of both—it can be yours. Start every morning on the right foot. A Terra Amico vanity is the focal point of your bathroom. Concrete, steel, stone & wood. Design your own vanity, and make your bathroom a truly custom space that will transform your home. Accentuate an opening, separate spaces, or create a sense of privacy with a Terra Amico barn door. Available in wood, steel, or a mix of both. Each of our barn doors is handcrafted to spec, with a custom track and hardware. Don’t need a barn door? Define your space with beautiful reclaimed redwood wall cladding or corrugated steel. Entertain your guests in style. Enjoy a cocktail around a live edge slab coffee table. Read a book off our threaded rod Dawson Shelves. Stream a movie from your TV that’s comfortably seated on a Terra Amico media console. Design your dream space, and order your custom living room set today. Terra Amico furnishings truly capture outdoor living at it’s finest. Custom outdoor kitchens, bars, dining tables & benches, planters, fire pits, barbecues, and pizza ovens. If you can imagine it, we can fabricate it. When it comes to your outdoor spaces, don’t settle for less. Before you can enjoy a meal at your Terra Amico dining table, you need the proper kitchen to make it. Our custom kitchen islands are both stylish and functional. A powerful marriage of blackened steel and reclaimed old growth douglas fir will shape your cooking space. Prep, entertain, and make gourmet meals with Terra Amico in your kitchen. Your fireplace deserves some attention too, and a salvaged wood or blackened steel mantle compliments almost every space. Hang your stockings from it, mount your TV above it, or display treasured family photos on it. Available in both solid beam, and our Easy mount hollow beam style.